Winter ends March 21st, so we now have less than a month left before spring. While lately I see flowers blooming all around me, I can still feel winter in the air. That’s winter in California. It’s very rare for snow to fall on the ground here unless you’re in the mountains. The last time it snowed at my house was about nine years ago. I know, you’re thinking poor baby. Look, we already have pink trees. I know you may find this hard to believe, but I’m not ready for the pink trees yet. Every year, they come so fast and turn to red leaves before I have time to take a picture. At least, I got one this year. In the meantime, I can appreciate a crisp day with gray skies; a day that encourages walking, thinking, pondering and reflecting. Sandee captures the mood beautifully in her post, Gothic Days. Enjoy your last days of winter. Perhaps, you’ll want to take a walk. Aw thanks for the shout out BF! I really appreciate it. And I love the picture of those trees. Glad you were able to catch them this time. You are too kind! See ya latah! Sure, Sandee! I really loved your post the moment I read it as I could relate so well to it. You’re a wonderful writer. I’m blushing! Thanks again — a girl could use a compliment every once in a while! Thanks, Dianne. 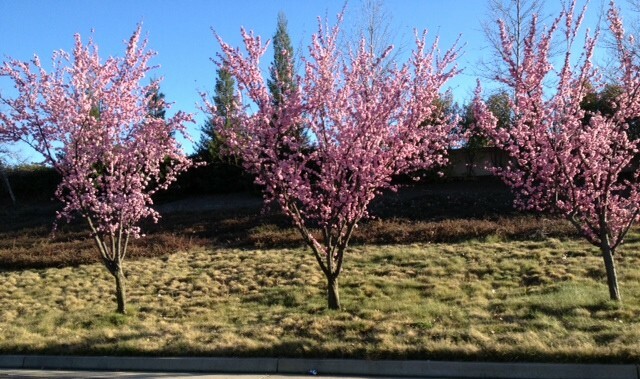 The blossoms are popping up everywhere. They are pretty and they sure don’t last long. I remembered this year. Sandee’s piece was really well written, really captured the atmosphere. For me though, I can’t agree with that opinion the weather, and I also really did think “poor you” about no snow. I love snow and I love hot sunny days with blue skies. It’s the in-betweeny gray days I don’t like. It’s good to know that all weathers are appreciated by some people though! Thanks, Vanessa. I know, I know…I’ll probably hear it about that. Poor me, too much sunshine. It’s just it gets old, or that I take it for granted. I like those days when I feel and see the storm a brewing. I think it’s exciting. I’m sure if I were surrounded by snow, I would think otherwise about all the sun. No no, I wasn’t being sarcastic, I really meant “poor you” because I really do love the snow. As much as I long to live in much warmer climate because I love sunshine, I would really miss the snow. We don’t get vast amounts here, but just a few days of a white wonderland makes me gleeful! Oh, really…okay! It would have been fine if you were. Some people do love the snow. I enjoyed it when I lived in Colorado. The sky seemed to turn pinkish…pink seems to be a theme. What is it in us that always make us focus into the future rather than appreciating the present? This is a good question. I guess because you know the future is there out in front of you, you sometimes forget you are in the present. That said, I don’t take the present for granted. I know…I would probably want the pink blossoms too, if I were you. Well, at least I provided a picture for you then. 🙂 I’m glad you like the light. I’ll admit I usually don’t pay too much attention to these types of things, Robert. I just hope for the best. Those are gorgeous trees. Looks like spring is well on its way there. It’s practically spring here, although nothing has budded yet. It never gets below freezing anymore and it hasn’t snowed in a long time. Enjoy the nice weather. Looks like a great place for a walk! I noticed yesterday that we have pink trees here in San Antonio–and we have a freeze warning out for the weekend. Rats. We go from 80F days to 30F nights in 24 hours. It’s just bizarre. You don’t know how you’re supposed to dress. Spring! I’ve got some catching up to do so I’ll check out Sandee’s post — she always has a way of inviting a reader into her space in such a way you feel you’re right there. Brigitte, that’s a most beautiful way to put it. Sandee makes you feel like you’re right there…I coualdn’t have said it better. She makes you feel like you took that walk with her. I hope you’re doing well, Brigitte. I’ve been thinking about you. A walk sounds like a great idea. Of course here I have to wear three layers of clothes and walk around piles of snow. It will be a “brisk” walk. Hopefully, it will feel invigorating, Michelle! Right. Like I know the names of these trees. I like calling them pink trees. They sound so magical and Dr. Suess-ish. It’s been a wet and dreary winter in the UK and we are getting ready for a wet and dreary spring! Oh, I’m sorry to hear that. I hope it can be wet and inspiring. Right, it’s possible. Maybe Sandee’s post will give you inspiration. If not, you can have the mental image of my pink trees. Fear not I have lodged the image thanks – will draw upon it for our wet and dreary summer to! Best wishes. Glad I could be of help to you, Ginger. Thanks. When it comes, it will probably be more meaningful. Meanwhile, we didn’t get enough snowpack this year! I hope there’s more on the way. I nominated you for the Sunshine Award! The details can be found here. Not ready for spring, either! Fall is my favorite. Too humid here in the south to enjoy summer. Hopefully, spring will take its sweet time, Ly. Summers must be rough in the south! Great post! A walk sounds good….